Home > The Quran Project Store > Biography of The Prophet Muhammad > The Qur'an Project Newspaper Campaign has begun! 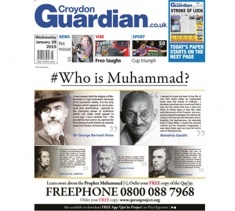 Alhamdulillah, the nationwide newspaper campaign promoting Prophet Muhammad (saw) has started. This is the first of the newspaper adverts in Croydon Guardian, London which will be followed by many others which are also booked inshaAllah. BILLBOARDS - We have also booked some Billboards, including Victoria Train Station to coincide with 'Global Week on Prophet Muhammad' starting 23rd Feb. Text code: "DAWA59 £10 to 70070"